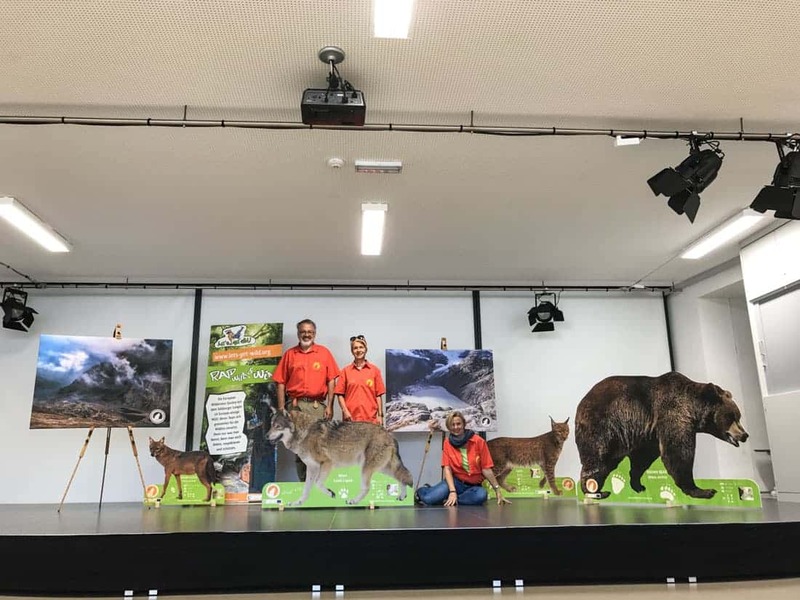 Ready for the first workshop with 150 school children as part of our Let´s get Wild school project in Austria, the European Wilderness Society has just received the life-size large carnivore displays depicting a Brown Bear, a Wolf, A Lynx and a Golden Jackal. The displays are a high quality print directly on wood. All four displays include basic data plus a map of the distribution of the large carnivores across Europe. The information is language independent so that the displays can be used all across Europe. In addition we are also producing matching Roll-Ups printed on linen and with a wooden frame to display further information on these animals plus wilderness, sheep, herding management, the ecological balance of nature and forestry. All of these are a great mobile presentation and can be used by schools, NGOs, Government or Agencies for education concerning large carnivores and their impact on our nature and agricultural sector. If you are interested in these displays, please fill-out the form and we will get in touch with you as soon as possible. Media Hype, Politicians in panic, Fake news in abundance!